HyperDeck Studio 12G is rated 3.5 out of 5 by 4. Rated 3 out of 5 by David from Great way to record video from ATEM switcher! This is a really well designed product. It's solid and works great. I love the hot swap capabilities! 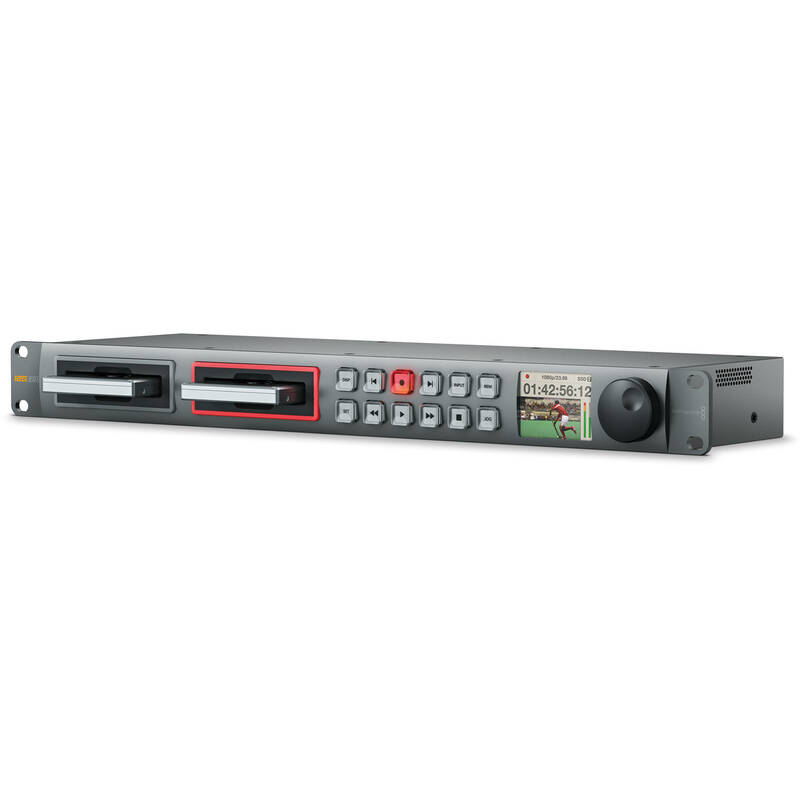 The bad news is that we are a recording studio and this unit as with most gear from Blackmagic, it's NOISY!! Another thing that bugs me about blackmagic is that they don't provide any type of power cable. I'm mean...really? Finally, you need an addition piece of gear in order to be able to read the drives. Blackmagic makes a nice dock for more money (no big surprise) or buy a third party SSD reader. Rated 5 out of 5 by MORGAN M. from Does what I bought it to do. Been using this unit for 3 weeks now only in HD (will use in UHD soon). So far everything has been great. I did read a review about the SSD being sloppy in the bays and that has been my experience so far BUT I'm happy with it. Pretty easy to use. Rated 1 out of 5 by Andy from GENERAL FAILURE - It doesnt work, when we try to upgrade the firmware after 100% was completed an error screen appears. The only solution BMD gave us is to send them the unit. They dont worry about the days we are going to be without the equipment or the cost the return will generate. B&H appologize for the inconvenience, and offers us to change the unit or refund us. Good for them. Rated 5 out of 5 by Anonymous from Works like advertised We use this device weekly and love it. Never had any issues or overheating as some have said. Proper venting for any electronic device is necessary. We're more than satisfied. As of 8/31/15 the product description for the BMD HyperDeck 12g notes playback for 4k and UHD. But UHD and 4k recording are suspiciously absent from this product desciption (versus BMD site). Is this just sloppy writing by B&amp;H or does this mean B&amp;H tested the device and this is what it is actually capable of? According to a Blackmagic representative: The Hyperdeck Studio 12G supports the following UHD 4K resolutions for recording and playback:3840 x 2160p23.98, 3840 x 2160p24, 3840 x 2160p25, 3840 x 2160p29.97, 3840 x 2160p30, 3840 x 2160p50, 3840 x 2160p59.94, 3840 x 2160p60.Cinema 4K (DCI) resolutions are not supported. Thank you for bringing this to our attention. I have passed on this new information to the B&amp;H webteam. Please be assured that B&amp;H makes every effort to have accurate descriptions as to the products we sell. However, when the catalog has over 200,000 items, occasional inaccuracies do occur. We apologize for any inconvenience this may have caused you. Is this compatible with SATA3 SSDs? Although I am not sure what the official documentation says, we are using Samsung SSD - 850 EVO 500GB drive very successfully. These are SATAIII drives and are operating wonderfully.